The Piedmont Swim Club lease expires on June 30, 2011. Negotiations for renewal of the lease are at a critical point. The City Council will be discussing the lease in closed session at its December 6, 2010 meeting. The principal obstacle to a new lease is the issue of rent. The Club’s position is that it already supports swimming programs for the Piedmont School District, the Piedmont Swim Team and the broader community at a cost to the Club of over $100,000 per year and it cannot, in addition, afford to pay cash rent. For 31 of its 46 years, the Club has provided those programs to the community, in lieu of rent. It did pay rent of $38,000 per year from 1993 to 2008, but, because of uncertainty about a lease renewal and the failure to have a long-term lease, Club membership has dropped by 145 (25%), causing a loss of about $400,000. For that reason, there simply is no money to pay rent. The City’s position is that, if the Club does not pay rent, the City will take over operation of the pool, which it understands will cost the City between $250,000 and $350,000 and will require the City to charge those families who participate in the swimming programs of the Piedmont School District and Piedmont Swim Team for their use of the pool. If you are a member of the Club, your kids participate in the high school water polo or swim teams, the middle school PE or adapted PE programs, or the Piedmont Swim Team programs, or you are a Piedmont taxpayer who doesn’t care about swimming but does care that the City not spend money on something that has been provided for the last 46 years at no cost, it is important that you let the members of the Council know, before their December 6 meeting, that renewal of the Piedmont Swim Club lease is important to you. Council member Garrett Keating, as a member of the Club, has recused himself from this issue. The names and email addresses of the other Council members are listed below, as are the important points on this issue. 1. Uncertainty about renewal of the Club’s lease and the failure to have a long-term lease in place over the last five years has caused Club membership to drop by 145 and forced it to lose about $400,000 in revenue and to completely use up all of its reserves. As of July 1, 2011, it will have no reserves. 2. The City helped get the Club into this fiscal dilemma and, if the Club is to continue to provide its support to the swimming programs for the kids of the community and public access to the community as a whole, at no cost to the City, the City is going to have to help the Club get out of it. 3. Returning the Club to financial health will be hard. The Club will have to regenerate prudent reserves for both operating and capital expenses before it can pay any money to the City for rent. Financial forecasts making reasonable assumptions over the course of a projected lease show that the Club can’t both generate those reserves and pay rent to the City. 4. In lieu of rent, the Club has offered to give the City any money it hasn’t spent at the end of the lease, if the City will use that money for pool operation or towards a replacement pool. 5. The Club is willing to continue to provide swimming programs for the community at no cost to the City. 6. If the City takes over operation of the pool, its own projections show that it will cost the City between $250,000 and $350,000, and the City will not be able to provide free use to the Middle School and High School swimming programs or heavily discounted use to the Piedmont Swim Team. 7. Other communities have had to close public pools for budgetary reasons and have established partnerships with local non-profits to provide swimming programs for the community. Piedmont already has that model and it has worked for 46 years. This would be a strange time for the City to abandon that model and take over operations of the pool at taxpayer expense, simply because the Club could not pay a rent which represents a small fraction of the cost to the City (rent the Club demonstrably can not afford to pay). 8. The Blair Park group, which plans to operate soccer fields in Moraga Canyon, is not being asked to pay rent. Why is the Piedmont Swim Club? Piedmont, California – October 15, 2010 – Following the unexpected and indefinite closure of the Alameda High School pool by the Alameda County Department of Environmental Health, the Piedmont Swim Club board of directors voted today to close the Piedmont Swim Club’s entire facility to its members on the afternoon of Thursday, October 21 in order to allow the Piedmont High School water polo team to host a game that had been scheduled at Alameda. After speaking to the Alameda water polo coach, Piedmont Swim Club General Manager Joe Perez indicated that a filtration problem was the reason for the Alameda pool’s closure. According to PHS water polo coach Brett Lane, the Alameda pool was closed for “severe” infractions, and the Alameda pools will have to be assessed, and then voted on by the City as to whether to pay for the repairs. In keeping with the Swim Club’s 46-year history of donating free use of the facility to the Piedmont schools, there will be no charge to the Piedmont Unified School District for this or any other PUSD use of the Piedmont pool. The Piedmont schools use the pool approximately 780 hours each year, of which 376 hours are exclusive use when the facility is closed to members. Use of the Swim Club’s main pool for water polo practices and games, as well as Piedmont High School swim team practices, requires that the medium and baby pools also be closed for safety reasons. PSC lifeguards, whose wages are paid by Swim Club member dues, are on hand to ensure compliance with the Swim Club’s rules and regulations whenever the facility is in use. The Piedmont Swim Club funds and operates Piedmont’s community pool under a lease from the City of Piedmont that expires on June 30, 2011. The Swim Club promotes lifelong fitness and water safety; donates space for the adaptive and aquatics physical education programs at the Piedmont schools; provides affordable, accessible, year-round and all-day fitness and recreational swimming opportunities to its members and their guests; provides weekly public swimming opportunities to all Piedmont residents; and provides practice and competition facilities to the Piedmont Swim Team and the high school swimming and water polo teams. The Swim Club also offers lessons to the broader community, local jobs for youth, special events and fun for the entire family. 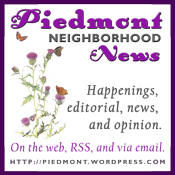 This letter to the editor was also sent to the Piedmonter and Piedmont Post. Josh Bernstein’s August 19, 2010 letter to the Editor “Time to reconsider pool management” makes several claims that could only be true in the world of “Alice Through the Looking Glass”, where things mean their opposites. First, it claims “[e]very taxpayer subsidizes the rent and operation of this private club.” In fact, the Piedmont Swim Club is not some exclusive “private” entity. Anyone in Piedmont who wants to join and is willing to pay the initiation fee and dues to support swimming in Piedmont is free to do so. The device of a “private” club is simply what allows swimming to happen in Piedmont at no taxpayer expense. Through its fees and dues, the Club operates the pool and supports the swimming programs of the Piedmont school district, recreation department, and swim team. The pool was built on donated land with donated funds and, whether the Club has paid the nominal rent it paid for 15 years or the no rent it has paid for the other 31, it has never cost the taxpayers a dime. Contrast that with the proposed, City-operated new aquatics center–with a competition pool, a lap pool and a children’s pool-Josh Bernstein is the principal advocate for. The City’s 2006 outside consultant’s report found that city operation of the pool (new or old) would require a taxpayer subsidy of up to $325,000. It put the cost of building a competition pool alone at $10 million. How the Club’s operation, which costs the taxpayers nothing, involves a taxpayer “subsidy” and the proposed multi-million dollar, City-operated aquatic center involves none, only Humpty Dumpty could explain. Second, the letter refers to the “years of acrimony between the City and the [Club]”. The only acrimony I am aware of comes from two small factions: those who want to use the pool facilities but don’t want to join the Club to pay for them, and those who support the dream aquatics center but, as yet, haven’t been able to convince the rest of the community to fund their dream. Finally, the letter implies that the recent pool closure involved a lack of “safety oversight”. How it reaches that conclusion when the DEH inspector who closed the pool found it was in compliance with the new safety laws, the letter doesn’t say. (The pool was initially closed because of failure to have certified that compliance, even though the law and DEH’s own web site said that certification was not due until September 30. It then remained closed so the drains and drain pipes could be reconfigured at DEH’s request to increase the flow rate of water through the drains by less than 10%. See, http://piedmontswimclub.com/whathappened.pdf. ) A recent KTVU report found that Alameda County has been shutting down ten public pools a week since July 1 and is the only county in the area that has found the need to do so in the middle of the summer. That is the real story. From the agenda for next Monday, January 7th, 7:30pm. For more info and staff reports, visit the Piedmont City Council page.